I'm always keen on trying new trends - whether they be right up my street or a little out of my comfort zone - I'll always give a new style a go. This is one of the reasons why I love blogging so much, it really opens up these opportunities and I try much more than I would have dared try in the past. You've probably noticed that my recent obsession has been suits: skirt suits, shorts suits, striped suits, pastel suits.. you name it, I've probably worn it! There's something about a two-piece suit that I blimmin' love! I have quite a few in my collection, most of which I've shared on my Instagram already (seriously, if you like seeing my style then that's the best place to follow me - I'm constantly sharing my daily looks! Find me by searching @peexo). My favourite thing about suits is the options you have with just one suit/two pieces. Firstly, it's so easy to wear both pieces together as they're intended - as a suit - you can change it up by pairing the two-piece with different colours and styles of tops. You can also break up the suit and style each piece individually. Now I know, it's not rocket science but often the easiest thing to do with a two-piece suit is to wear both pieces together and you end up forgetting that the two don't need to be paired together all the time! For instance, with this suit, I know that these trousers will be the perfect item for spring/summer! Paired with a crop top or a cami and some sandals would make a great outfit on holiday. Add a shirt to the trousers and some heels for a smasual (smart casual) outfit. Blazers make for the perfect pairing with dresses so pick out your favourite summer dress to wear with this blazer layered over the top in spring. 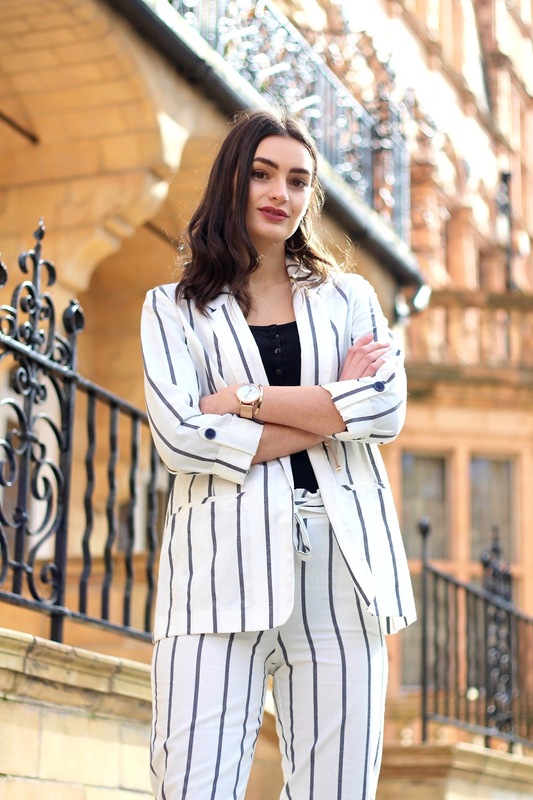 Onto the best bit, this blazer and trouser suit combo is from Primark! Both costing a mere £35 (blazer: £20, trousers: £15) now where else would you find a two-piece suit for less than £40? Recently I've been singing all the high praises of Primark but I just can't help myself, everything they're doing right now is just so good! I uploaded a haul video on my YouTube channel a couple of weeks ago (you can find my channel by searching 'peexo vlogs' on YouTube) where you can see all the amazing pieces I've picked up recently - watch my Primark haul here. I cannot believe that suit is Primark! I would never have guessed it! They've really started to up their game - I must visit the store more. I'm loving suits and any sort of co-ord at the minute too - you're so right about it giving you so many more outfit options!